It is undeniably the case that racist Americans are almost entirely in one political coalition and not the other. It is undeniable that some Americans are racist but racists split about evenly across the parties. No party has a monopoly on racists. I think Tabarrok’s conclusion is closer to the truth that Hayes’s statement. Let me see if I can elaborate this issue in some useful ways. As a measure of racism—and by no means a perfect one—I will use two different items from the 2008 American National Election Study. Respondents were asked to evaluate whites, blacks, Hispanic-Americans, and Asian-Americans on two scales. Each scale was numbered 1 to 7. At one end was the word “intelligent” or “hardworking.” At the other end was “unintelligent” or “lazy.” Respondents gave their answers to these questions with an interviewer present in the room, but on a laptop computer that was not visible to the interviewer. This is obviously intended to mitigate any unwillingness to express unfavorable attitudes toward a group. The plurality of whites put themselves at the midpoint on the scale. 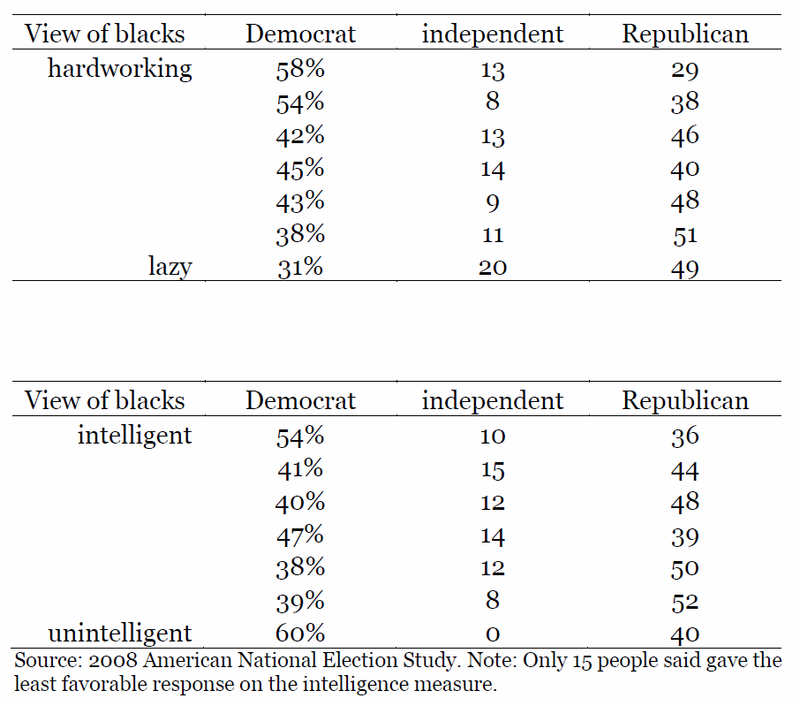 However, assessments of blacks as “lazy” are more common than assessments of blacks as “hardworking.” By contrast, assessments of blacks as “intelligent” are slightly more common than assessments of blacks as “unintelligent.” One thing to note: only about 5% of respondents did not express any preference, although I do not display them in the graphs. One other note: whites also tend to rate whites more favorably on these scales than they do blacks, although I do not show that here either. Now, to Hayes’s statement: what percent of Democrats, independents, and Republicans are located at each of the seven points on each scale? Overall, Republicans are slightly more likely to assess blacks unfavorably on these dimensions. For example, 39% of Republicans place blacks on the “lazy” side of the scale, while 31% of Democrats do. But by and large, Tabarrok is quite correct: both parties include substantial fractions willing to stereotype blacks unfavorably. 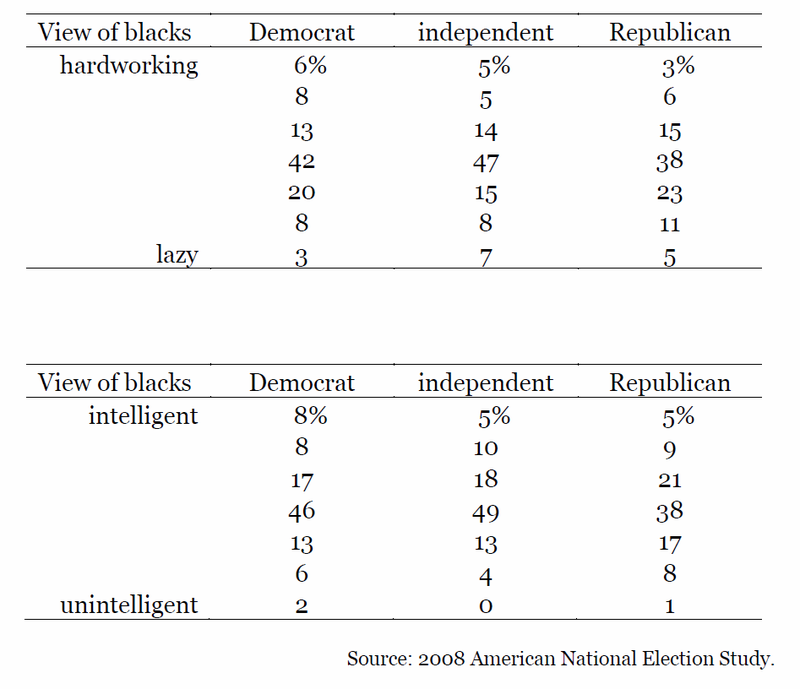 Thus far, I’ve essentially asked, “What are the racial views of Democrats, independent, and Republicans?” Let’s turn that question around and ask, “What is the party identification of people with favorable, neutral, and unfavorable views of blacks?” Here are two tables. Now the percentages should be read across the row, rather than down the column. Note that independents who lean toward a party are counted as partisans. In sum, I don’t think Tabarrok is technically correct to say that “racists are split evenly between the two parties.” At least by these measures, the split is not exactly even. But he is absolutely correct to say that neither party has a monopoly on racists. 51 Responses to Are Racists Only in One Political Party? Can you do these graphs again isolating black respondents from the list. Is the difference smaller since African Americans probably have the most favorable views of other African Americans and that may skew the data for other democrats. Joseph: Everything in this post is among white respondents only. Don’t you think it’s somewhat misleading to omit 35% of the population? Could you run the numbers without LA and WV “relic” Democrats? I suspect they could be causing a significant skew. According to the two Fall 2011 Gallup polls of the parties, non-Hispanic whites comprise 63 percent of the Dems/Dem-leaners, while non-Hispanic whites make up 87 percent of the GOP/GOP-leaners. Yes, whites are the majority in each party, but it seems. . . incautious to generalize from the views of white members to the membership as a whole. *I’m not criticizing the NES study so much as the use made of it, that is, taking a slice and pronouncing it the whole pie. You’ve demonstrated that prejudice is spread across both parties. While some people may use prejudice alone as a definition of racism, I think the Chris Hayes quote is referring to racists as people who act, or advocate action, to discriminate (infringe rights) based on that prejudice. Dave: It’s absolutely a fair point that these measures may not get at more “active” forms of discrimination. Hence my qualifier “and by no means a perfect one” with reference to these measures. It would be interesting to see if racist attitudes correlate with other factors: foreign policy views, “patriotism,” union membership, political activism, etc. Is stereotyping really racist if it’s based on truths and facts? And aren’t the questions you present more about income rather than about the color of someone’s skin? Yes, blacks are overrepresented among the lower income segment of the population and IQ and income are positively correlated. The responses aren’t necessarily racist. Even if IQ and income are positively correlated, it isn’t logical to jump from that fact to the conclusion that blacks are lazy or unintelligent, just because they make less. These stereotypes are not based on facts. You need to consider that part of the reason that blacks, women, and other groups don’t make as much money is because they have a number of other hurdles to face. In this case, blacks are discriminated against, (it’s not the other way around, where some people think they’re lazy because they don’t make as much money). I don’t think the point of this survey is to fix the problem of income inequality but to see if racism is unique to a single political party, which it shows is not the case. It does a good job of doing what it set out to do. I do not like the way this survey is designed. Based on the higher percentage of blacks who are not part of the labor market, I would grudgingly respond that blacks are on average somewhat lazier (but not less intelligent) than whites. HOWEVER, this is a function of deeply entrenched historical, systemic and cultural factors having nothing to do intrinsically with race. My response would not be based on stereotypes but on an attempt to match a number (1 through 7) to actual data. I’m sure other respondents would have racist reasons for judging blacks as more lazy than whites, but how would you measure this? It seems to me that a better-designed survey would have you rate statements like (using the same scale) “Blacks have lower levels of employment because of the continued legacies of slavery, segregation, and discrimination, which have put blacks in a disadvantaged economic situation that has been difficult to get out of.” Or, “I am afraid when I see a black person.” Or, “It is fine for a white woman to get married to a black man.” I can almost guarantee that with questions like these, you would see a big difference between the responses of Democrats and Republicans. Giantslor: If you click through to the Alex Tabarrok post that motivated my analysis, you will see that Democrats and Republicans have fairly similar views on interracial marriage. Well. Hurray for progress! I maintain that the question about employment and economic injustice, at least, would draw very different responses. But not conservatives and liberals. Believe it or not, there are racists that other than just having a gripe against “Black” people. I know a few Republicans that cannot stand Mexican people. (say they take jobs, dirty, etc) but at the same time would say they are hardworking. Isn’t it likely that there is more socially desirable responding among Democrats on these questions though? -Do you think that decisions on college admission should be based solely on past performance and future potential, or should race play a part in the decision? -Would you vote for a president based only on the fact that he was of your race? -Do you think that having a Caucus, Student Union, or other group that only accepts, and only advocates, for a single race, is racist? -Do you feel like members of another race owe you something? -Have you ever accused someone of “acting like” another race? -Are you part of a group, club, or other organization that has a race or ethnicity in the name of the group, or that specifically excludes people of a different race? And of course, I would ask people of every race, not just white people. That’s racist. I’m (at least by and large) with Pippi. I don’t think of “racism” as acknowledging that the average American Hispanic has less education than the average American Asian, I think of “racism” as meeting a Hispanic and jumping to the conclusion that they must be ignorant. Similarly, if there are more racists in one party than the other, researching and acknowledging that fact isn’t bigotry; seeing a racist and thinking, “that person is obviously from my less preferred political party” is. I think the Jews are smarter. Is that racist? What if the Jews really are smarter? Come on, you gotta control for age and wealth plus give us more info on sample sizes. No need to control for anything; the analysis is merely descriptive. No causal claims being made here. Though I agree it would be interesting to see these things. Brandon: Hayes made a simple descriptive claim, and I am evaluating that claim and that claim only. So it’s entirely appropriate to examine only the relationship between party identification and racial stereotyping, without “controlling for” other factors. The approximate sample size is 1,100 white respondents. A problem, as others have pointed out, is that the definition of racism is not clear. The racism measured here is overt bias, but racism is more than that: Racism is a social structure in itself. If we are to measure racism, the questions here are simply not enough. I generally do not think it appropriate to measure racism, sexism, and other forms of discrimination in this limited way. Social Psychologists and Sociologists, for example, have documented the impact of “stereotype threat” on minorities’ performance, something we cannot really measure if we just ask white people what they think. In fact, asking white people — like this short paper set out to do — reveals that white people view racism today in a surprising way : increasingly against them! Belittling, denying, or justifying the racist status quo is also a form of racism. Yes, I think it’s likely that one party -does- have more “racists” (of any sort) in it than the other, but we need more nuance in measuring it. Racism takes many different forms — even “well-meaning” activists are guilty of it. Excuse me while I go print out my next KONY 2012 poster. Nujavi: A single blog post is not going to be able to document the sprawling literature on various forms of bias, stereotype threat, and other relevant literatures. Indeed, the post acknowledges that 2 measly survey items cannot possibly be sufficient — hence my qualifier “and by no means a perfect one.” But it’s far from clear whether or how all this additional literature would lead to a different conclusion about Hayes’s claim. Republicans are systematically eliminating voting rights of blacks. That TheMonkeyCage is trying to spin Republican racism into a false equivalency of ‘both sides do it’ is either profoundly ignorant or disturbingly dishonest, either of which seriously discredits this website. IOKIYAR: All the post establishes is that both parties contain people with negative stereotypes of blacks. The evidence it cites is relevant to evaluating a claim like Hayes’s, although it is certainly not the only relevant evidence. My post does not advocate any “false equivalency” with regard to the other issues you raise, which have to do with public policy and actions by party officeholders — and which are a different subject altogether. These numbers may be accurate, but in terms of visible expressions of racism in the media since President Obama was elected, the Republicans win hands down. The presence of Obama in the white house has excited their anxiety. The racism is all over the internet, and is frequently apparent on FOX news. This gets at what some commenters mentioned, active prejudice versus attitudes. Whether someone is hardworking, lazy, intelligent or dumb is overwhelmingly determined by socialization. To the degree that it is not, it is a variable that knows no distinction towards or away from people with genes from any particular area of the globe. So racial disparities are entirely explained by socialization. Unfortunately, a large part of conservatism is about denying the effects of socialization, and opting instead for a view of human nature in which people have a sort of socialization-transcending agency. This is convenient when apologizing for disparities and inequity. But it also creates a narrative in which racial disparities are difficult to explain without appealing to a racialism. Wouldn’t a better measure be how whites perceive the differences between themselves as whites and blacks on these scales? Does the NES ask whites where they would put white people like themselves on these scales? If it does then one could develop a measure of perceived difference between one’s own group and the ‘other’. It is variation in this perceived difference, as I understand social identity theory to suggest, that will reveal the degree of underlying denigration toward out-groups. So, for whites, does the average perceived difference in identity traits between whites and blacks differ across political parties? John: Thanks. Is the difference across parties insignificant statistically? Also does this difference predict to political preferences that are in some sense more discriminatory? For instance, would Democrats who perceive the same degree of difference between whites and blacks as Republicans be equally likely to support voter ID laws as these matched Republicans? Hey John, would be very interested in seeing the column percentages instead of the row percentages. J: Both are in the post. I was wondering if anyone would make the point that Iain Johnston made. Acknowledging the caveat that the measure is imperfect, it seems that the measure has one fundamental flaw: we don’t know what those same whites think of whites. Consider two imaginary respondents. R1 thinks 10% of blacks are lazy and unintelligent, while 4% of whites are. R2 thinks 20% of blacks are lazy and unintelligent, and 20% of whites are lazy and unintelligent. By the measure of the post, R2 (whites and blacks both at 20%) would be considered more racist, when it seems pretty clear that R1 (blacks at only 10%, but whites at 4%) is more so. MTNance: See my response to Iain Johnston above. I think Scott (5:38pm) above makes the point that explains why we need educational and income data to evaluate these numbers. It has been shown time and again that the average Republican is significantly richer and more highly educated than the average Democrat; it is probably the case that the richer and more highly educated an American is, the more keenly that American feels statements like those in the survey to be socially undesirable responses, not things they are likely to say to a stranger on the telephone. So, the fact that Republicans are so much likelier to give the socially undesirable response might suggest that they are in fact even more strongly anti-black than the raw figures indicate. 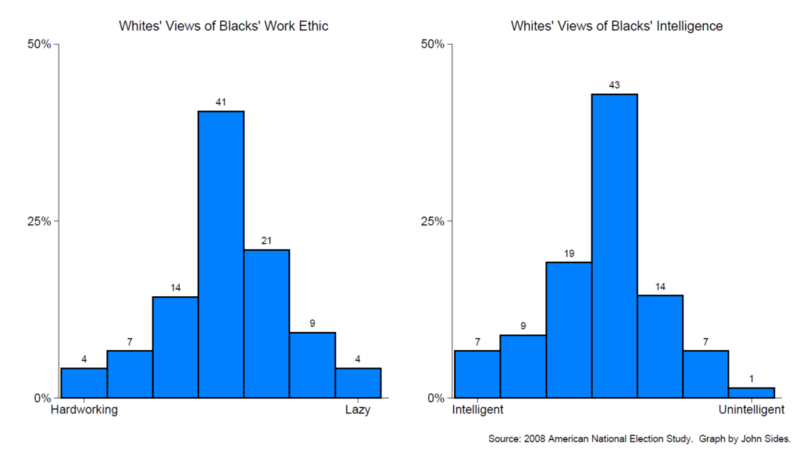 What I find significant is that “are blacks intelligent” or “are blacks hardworking” are always supposed to be taken as opportunities to demonstrate the respondent’s virtue, and in no way as subjects for empirical investigation, although as a matter of common sense there seems to be plenty of room to investigate them empirically. However, even the suggestion that one might empirically investigate whether blacks are (on average) intelligent or hardworking is enough to get one branded with the scarlet R of racism. Always? I’m pretty sure that The Bell Curve was published in 1994. Sure it was often denounced as racist claptrap, but that’s because it is racist claptrap, and it found plenty of defenders. I believe there is a dimension here that is very important and it wasn’t considered. Two people who make an identical assessment on characteristics may actually expect to deal with them in very different ways. As a liberal I believe it is far more important to say that someone who doesn’t work as hard as I do still deserves equal protections under the law that I do; or even that the children of people who don’t care as much about education as do I still deserve the same opportunity as do my children. These sorts of things are, in my opinion, where the difference lies between liberals and conservatives. One of the ways that racist systemic structures are preserved is that we talk about people or groups being racist people and then treat the affair as solely a question of attitudes and intent, rather than centering the discussion on racist words and actions. This allows a greater latitude for conscious lying about intent, for unconscious biases, and for structural patterns. Chris Hayes is unintentionally leaving the discourse in the same place. But discussing what is the political identification of people who will admit to holding openly racist ideas is a very minor issue in any substantive discussion of how racism and politics intersect. Mitt Romney can easily claim his descision to repeatedly lie about the Obama administration and welfare isn’t about racialized stereotypes, but it should be perfectly clear what’s going on. How come if a black is prejudiced against whites he or she is not accused of racism? How come if an African American employs only blacks in the workplace he/she is not branded a racist but a white who employs only whites is branded a racist? Is it that by definition a black cannot be a racist or what? By the way, I am neither white or right-wing. I defy the pollster or anyone who is a White person, male or female to dye his or her skin and hair and pass through our society disguised as a Black person. If he or she has enough courage to do that, spend at least two months in that role and then write a report and statistics. I have a problem with the numbers here. Even assuming the data is valid (see also Bradley Effect), the data cited only has possible value in measuring this if the frequency of racisim in US society is large. For example, if 80% of racists were Republicans, but only 1% of the US is sufficiently racist to admit it, that would not show up at all. If 80% of racists were Republicans, and 10% of the US was racists, you would get about a 6% difference in racist ratings between Republicans and Democrats. Look at the household survey – the difference between the total of lowest two “lazy” ratings was 5%! I don’t see how that analysis proves no link between political ideology and racism. There’s a difference between having biases and actively supporting an agenda that expresses your biases as clearly as the Republican party does when it comes to race. It’s one of the main prisms’s through which they frame their opposition to the welfare state. The definition of racism isn’t simply holding negative views towards people, that’s human. It’s using political power to enshrine those views and gain advantage by way of those views. That’s what makes the Republican Party so hard to deal with at times, and why comments like Chris Hayes’ make sense to me. Out of curiousity, could you run a probit and conditional on background (exogenous) characteristics, estimate ordered logits on these questions? The most fundamental problem though is that the author believes perceptions can only be explained by racism. Maybe the report should begin with the author’s definition of racism. “Lazy” and “unintelligent” are difficult to quantify and therefore difficult to show evidence for. Therefore, if someone attributes these qualities to a group or race, it is easy to dismiss them as a racist. The underlying premise is that there is no difference between races. If you can’t show evidence to support your premise, your survey is no more scientific than the gut feeling of the respondent. Try asking questions that have objectively verifiable right and wrong answers and compare people’s perceptions to reality. I think the term racist is a bit ambigous here. used in the broadest sense i think everyone on the planet could be fingered as a racist, and the largest percentage of racists would likely be found in the racial groups who are the supposed victims of racism. I wouldn’t be trying to ascertain whether someone was a racist based on beliefs that are more a product of survival instincts (feeling more comfortable with your own type, fear and mistrust of the unfamiliar and unknown ) and human emotions (love of self extended to ones own family and hence ones race or country- which is simply an extention of family). NO, id be using criteria based on what most people would define as a TRUE racist, a HATER that joins hate groups and attempts to ACT on his racist beliefs. i believe that might get us some much more interesting findings, that one could actually DO something with. for example: What is the political affiliation of the KKK? Of all the hate crimes committed in the last century what percentage of them were committed by democrats or republicans? The answers to these questions ill bet would be considerably more revealing. They would also much more closely fit the average persons defination of a true racist, and not include as racist so many white people that voted for Obama , gave money to support black colleges and think Martin Luther King was a national hero and did all of those things based on merit and a sense of fairness not guilt. I dont believe a person that would do all those things would fall into the average persons defination of a RACIST just because they perceive a group of chronically poverty stricken people because they mistake the chronically depression and lethargy that often accompanies a seemily hopeless situation as laziness. I want to know what party if any lends itself to the TRUE racist and i didn’t get the answer here. i apologize for not proofreading the above before posting. It should read: I dont believe a person that would do all those things would typically fall into fall into the average persons definition of a racist. Are they racist, simply because they perceive a chronically poverty stricken race as uneducated and therefor ignorant? Or because they mistake chronic depression and the accompanying lethargy for laziness amongst those same groups of people with little hope or opportunity presented to them? -you might argue that they are misinformed, or guilty of overly generalizing, but RACISTS? really? were are your graphs on which groups of blacks are most racist towards whites. were are your graphs that shows black are actively more racist towards whites who are the least racist towards them. you are an idiot stoking the fires of racism. If you really care why don’t you do something that helps. In my experience from California – I do not think blacks are different genetically and met almost none that do or did. – like all groups, even white within white, there are cultural differences which I do not perceive as either bad or good. Actually I see the most hate and prejudice form liberal to conservative and vise versa. Both sides are losing one of their most precious things – an open mind.